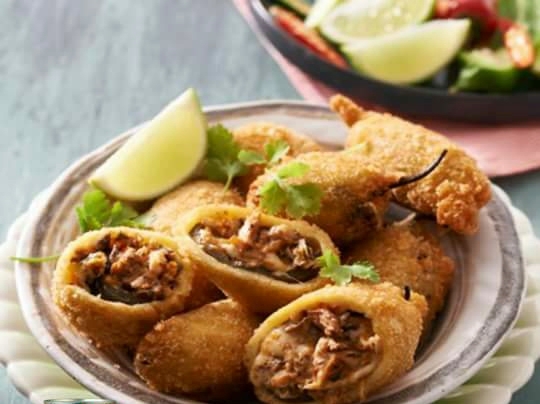 Why not celebrate this festive season with your family and impress them at the same time with our delicious Sardines and Jalapeńo poppers! Serves 12. Drain the Lucky Star Sardines. Place the Lucky Star Sardines into a mixing bowl and break into small chunks. Add the remaining ingredients and mix to combine. Make a slit in each of the jalapeno peppers and scoop out and discard the seeds. Fill the now hollow peppers with the filling mixture. Place the stuffed peppers in the refrigerator for 30 minutes to firm up. Mix the flour and salt and pepper into a bowl. Coat each pepper in the flour mixture, shaking off any excess, then into the whisked egg and finally coat in the fresh breadcrumbs. Heat the oil for deep frying. Fry the poppers, in batches, until golden brown and crisp all over. Drain on paper towel. Serve warm with fresh coriander and lime wedges.